"We didn't want that titan/region/blinged subcap/fleet anyway" is the most common form of damage control, along with "lol it was hilarious explosion". However I see now that we totally misunderstood it. We believed that it's a form of external damage control aimed to protect the status/reputation of the group in the eyes of outsiders. If we didn't want it anyway, than losing it had no effect on our status. If it was hilarious, than we actually wanted it happen, so we remained in control. Makes sense theoretically, but actually not. Anyone within the EVE community knows that this is lame and anyone posting "didn't want it anyway" would be laughed off, adding further reputation loss. First thing first! Miner, calm down! Now we can analyze what made him so mad that he could no longer control his posting. Yes, my crime was to not post "MoA didn't want that titan anyway" or any other good stride and humor comment. Instead I wrote that it was a bad thing, a defeat, a loss, something that must be prevented from repeating. 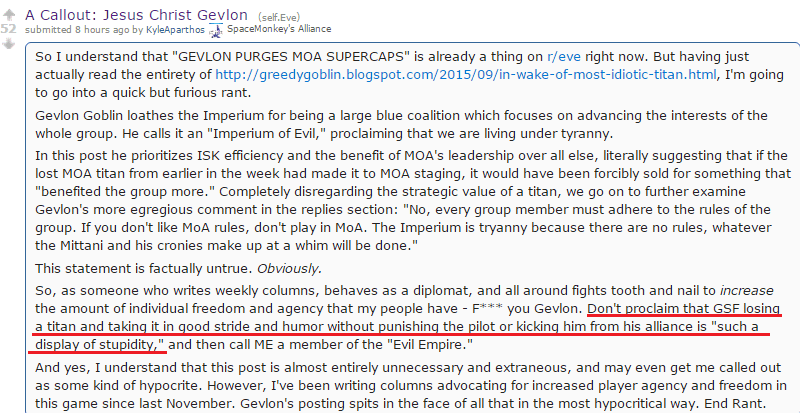 If "didn't want it anyway" was meant to be external damage control, the propagandist of the Evil would be celebrating "Gevlon accepts defeat, admitting MoA is bad and has to improve" instead of being mad. "Didn't want it anyway" and "it was hilarious" are forms of internal damage control, to protect the morale of the morons and slackers. They are aware at some level that they are useless. That's why they constantly compensate by yelling "we are having fun" and "we are here for our friends". When defeat happens, they are afraid of being held accountable for it (rightfully, since they messed it up). By declaring "didn't want it anyway", the speaker assures the morons and slackers (a group that might contain himself) that such thing will not happen, the loss will not be punished and they don't even need to get any better. 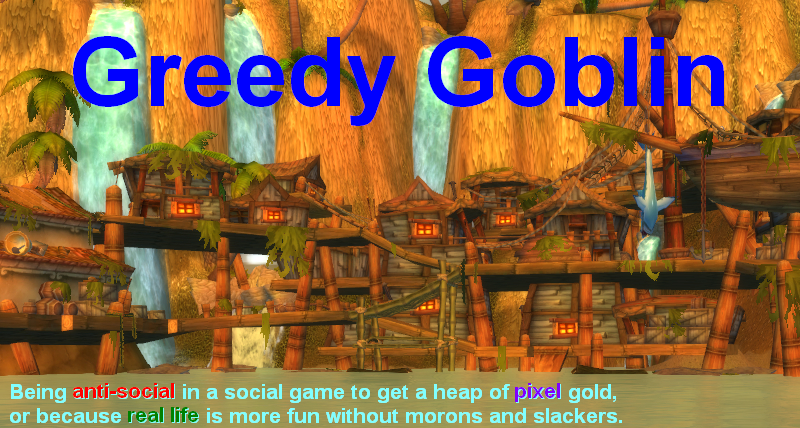 When the Evil One pinged "WELP GODS APPEASED WE CAN OFFICIALLY WIN THIS SOVWAR NOW", all the minions were assured that no matter how bad they are, they won't be called out. After all it's hard to be dumber than President Skro0b who used his titan to kill interceptors. The propagandist of the Evil is uncontrollably mad at the idea that failure is not OK. It's totally unacceptable to him that one must improve and those who display idiocy beyond repair must be removed. He sees performance standards as tyranny. He finds meritocracy so disgusting that he throws all his propaganda knowledge and dignity to the wind and butthurt-post on Reddit. He is a model social, who defends morons and slackers from an ethical standpoint: "being bad is not your fault, everyone is special and valuable, all that matters is love". For him the only valid response to failure is "it's OK, it wasn't your fault, here, take welfare". Every time you post "I didn't want it anyway", you spread the poisonous idea of socialism. Don't do that! Admit that you failed and promise to improve and win next time! If you see this embarrassing, if you go the easy way, one day you find yourself in SMA, providing tears to me. I'm sure it's not where you want to be. Or they just don't care as much as you. A loss is a loss, but it doesn't mean people must rage about it. Titan down, the owner may have learned something from it, but as a whole, it didn't matter as much. At some point, such things become trivial. It's a function of distance and wealth. If they don't care, why do they post "I didn't want it anyway"? I regularly lose empty shuttles and pods to smartbombers in Frulegur. I post nothing, because I don't care. You care enought to post a screencap in a p.s. every time you put a wrong sell order up. Because those are costly mistakes and I want to warn everyone against them. But... You did basically post "didn't want it anyway" didn't you? I'm sure you claimed that the isk for it was entirely fetched by that guy alone, and had it been brought into the alliance he would have been forced to sell it anyway, so it wasn't a moa loss. That's basically the same thing, trying to distance the loss from moa. Have you even read that post? I said that if the titan lived, the pilot would have been informed of his bad decision (that it's a kill waiting to happen) and also ways how could he use the ISK. In best case he'd agree to sell the damn thing, buy 25 dreads, distribute them and drop the dread fleet on the next dumb Goon smartbomb-camping a gate. They keep claiming MOA is a tyranny yet the Imperium isn't. They're confused, believing that performance checks are tyranny, yet doing whatever the Imperium leadership feels like for no reason other than a whim, ordering them like puppets, isn't a tyranny. Its a game, whether its a titan or a shuttle, its all funny as hell and laughing about it which is what the "Didn't want it anyway" comment is about, is simply that, a laugh. Some of you guys honestly take this game to seriously. Zyrus, my masters give me cake, community and a sense of purpose. And a chance to shoot spaceships while drunk or fapping. What's not to love from being in the Tyranny? @Amyclas Amatin: for a man with no greater purpose than shooting pixels while drunk or fapping, tyranny is the perfect system. No irony here. I'd like you to draw an line here. Failure in a controlled environment is necessary (and is, in fact, one of the best tools) for human learning. Everything in Eve is, ultimately, a controlled environment. All failures within it are equal and are simply tools for learning. Is your problem with goons that they don't give hard enough feedback to failure so people don't learn? Or do you actually believe losing a titan to interceptors in Eve says anything real about anyone? Both. Goons openly reject the idea of failure, the one who failed can honestly believe that he did everything by the standards of the group (and most cases he is objectively right). Losing a titan needs having a titan first. You can get a titan by farming for 150-1000 hours (depending on your ISK making ability) or paying $1500 for PLEX (or paying $750 on the black market and risk your account). If someone puts so many real world hours or money into a video game where he is so incompetent that he loses the said titan in minutes, well, I believe that person is an idiot in real life. No less idiot than the guy who puts $1500 on a horse race without having any clue about the horses. I've lost more than that, but if it wasn't for them I'd make 0 isk in that pocket. Despite the fact that I was stupid with losses (taking a non empty pod through), I'm glad those guys are there. Maybe not a case of IDWIA and more of a case of "oh well at least I got something better now". > Because those are costly mistakes and I want to warn everyone against them. Gevlon, I think you might be losing track of something basic here. You pay for people to kill goons. You don't ask them to take you with them, or provide them with ships, you provide them with isk. Isk in one end, dead goons out the other. You provide your isk to whoever does it the best. You should't worry at all about what happens in the middle! Terrible management? Laughable kills? Horrible isk efficiency? These could be problems, but as long as the dead goon production is still worth your donation, they're not your problem. Let's say that this fumble is repeated, using money you provide them. Every week for long enough that they can't afford actually effective ships. That would reduce the amount of useful work MOA does. Your reaction to this should be to fund the competition, not worry about trying to change the way they make decisions or the quality of work they do. Gevlon, I think you missed the point of the part you underlined. You are condemning lack of discipline for failure, but then you are just proving Kyle's point. You call the Imperium "evil" and "oppressive", yet MoA is far more strict and oppressive than them. Ever heard of sarcasm? When someone says "didn't want it anyway", that's a sarcastic way of saying "I fucked up". - Mittens have a good day: you get a titan and roles. @Anonymous: you are right. However I'm also a blogger, and the way MoA handled this situation is excellent material to show meritocracy at work. @Next anon: kicking bads is not oppression. Forcing people to carry bads is. @Last anon: the Mittani wasn't sarcastic. That monumental stupidity had no consequence. You are implying that the person in question vies money in the same way you do, or has the same trouble earning them as you do. In fact, nearly never the case. @Maxim: the average player rats or runs mission. Getting him the ISK is much more tedious than for me. @Arrendis: now I remember why I kicked you from this blog: endless arguments over irrelevant technicalities, avoiding the point as far as possible. Go away and never come back! So are we talking average players or Titan owners? Really can't have your cake and eat it on that one. Gevlon, I think you are now ready for the next step. It's time for you to start reading the Anonymous Conservative and educating yourself on r/K selection and narcissism. The goons are a narcissistic organization, and the free resources of EVE compel people to be rabbits. It's all there in the books/site. I can't help noticing that the socialist evil power that was supposed to be defeated by now is still there, still the most powerful entity in the game and the meritocratic powers are apparently unable to move against it.